Every passing minute brings us closer to the next school shooting. There were 24 resulting in injury or death last year — an average of two per month. Politicians didn’t address the problem in 2018, and they won’t this year either. The never-ending political debate between the right and the left has overshadowed arguably the best and most immediate solution: artificial intelligence. We took a look at school shootings because we thought it was somewhere that AI could have an immediate impact. What was happening was tragic, it was always all over the news. We wanted to do something about it. What Athena Security is doing to address the problem involves integrating computer vision-solutions into existing CCTV systems, thus allowing on-site security/faculty to detect and deal with emergency situations in real-time. The AI employed by Athena Security detects the motions and objects associated with a human brandishing a firearm, she says. And it can react immediately. Falzone told us that Athena Security’s home-brewed machine learning solutions are capable of recognizing pistols, shotguns, and even assault rifles like the AR-15. Many experts believe that AI can analyze the data from historical school shootings and find patterns that humans may have missed. Others propose that machine learning could help therapists and school counselors determine “risk levels” for students — they believe this could prevent some students from becoming shooters. Some even point to China’s in-classroom facial recognition systems for inspiration — they’re robust enough to determine if a student is paying attention. And still more are developing AI to monitor student and faculty social media accounts for clues that something’s not right. But most of these solutions require us to trade our children’s privacy for their safety — their freedom for their lives, in essence. If democracy is to thrive, this is an unacceptable tradeoff. 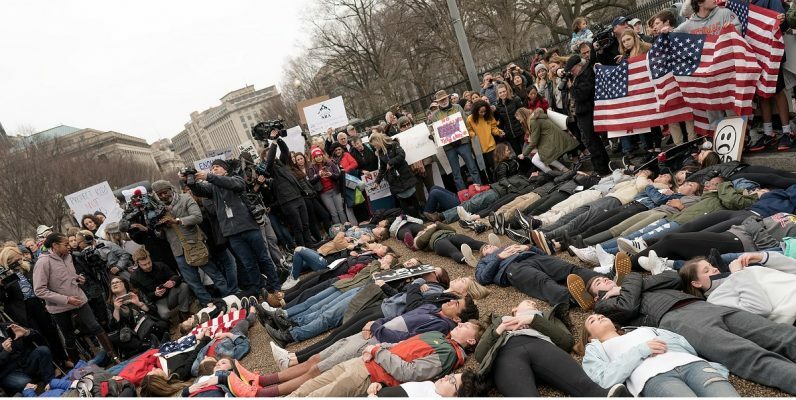 During emergency situations we don’t necessarily need facial recognition — though there is merit to the idea of keeping uninvited individuals off campus; nine of the suspects in 2018’s shootings were students who had once attended the schools they attacked. Until we can react to the specific moment a would-be killer brandishes a weapon, all other solutions are tangential. Falzone said Athena Security’s system can integrate with existing safety systems, not just in that it works with almost any off-the-shelf camera system, but a gun alert, for example, could trigger safety locks in all the classrooms and at hallways — effectively confining a shooter to a specific area, for example. Within seconds of detecting and isolating a shooter, the same AI informs law enforcement and emergency responders. It can then provide up-to-the-second information on the location of every person on campus (at least those within sight of a camera). These solutions are nascent, and dependent upon each school’s design and layout. But they’re promising. “People don’t want metal detectors and security guards at all the doors in their schools, it makes it seems like a jail. Cameras are less-intrusive,” says Falzone. There’s also the fact that metal-detectors can’t detect certain kinds of firearms, track a suspect through hallways, or shutdown specific areas of a school to save lives. Not to mention, as hard as it is to stomach, we know that a motivated shooter with an AR-15 has an advantage over a security guard with a handgun. You can’t shoot AI. We asked Falzone what needed to happen in order to get these solutions into US schools and start saving lives. She explained that, by and large, it wasn’t the politicians holding things up — it was the schools themselves. It’s not that they don’t want to, it’s that they have specific budgeting processes and maybe they want to have the system but can’t do it right now without approval, or they don’t have the funding right now. What could possibly be more important to a public school district than the safety of their students? Most schools do have a security budget but about half had increased their budgets in the wake of another year of school shootings. Clearly, that’s not enough. I can tell you with a lot of confidence that this technology, incorporated into Marjory Stoneman Douglas, would have probably saved all 17. Including my nephew — who was one of first people shot. It’s time we stopped relying on politicians and people who only want to discuss gun control and the 2nd Amendment to save us from evil. We’re moving backwards at the expense of our children’s lives. Every person with loved one in a US public school should unequivocally demand that our local governments and school boards do something about school shootings right now. The clock is ticking. Read next: If tech companies are hurting journalism, can they also help save it?